Alex Duncan was born on April 24th, 1884 in Grayrigg, Kendal, Cumbria, worked in the family business (Minto Feet Nurseries, a market garden and florists) and died on January 21st, 1959 in Kendal at the age of 74, yet we are told that ‘by his own affirmation he “had not a drop of English blood in him.” He stands out in group photographs of runners because of his height – he stood 5’11″+ (1.82m) and weighed 164 lb (82kg) when most distance runners are on the small side. Starting out in athletics as a track runner in 1902, on 26th July 1902, at Belle Vue, as a member of Kendal Welcome Harriers, Duncan won the mile handicap off 111 yards (running 1507m) in 4:22.8. A year later on 6th June 1903, at Halifax, he covered 1674 yards (1530m) in 4:19.2 and in a two miles team race at Lancaster on 1st July, he ran the fastest time of 10:26.8. In 1904 on 1st August at Barrow, he covered 1691 yards (1546m) in 4:16.2, and returning to Lancaster on 24th May, he again had fastest time in the Two Miles team race this time 10:14.0. 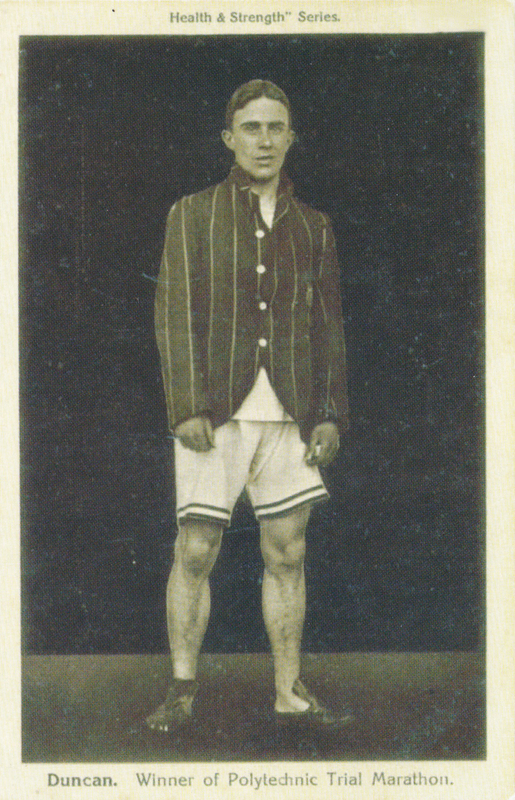 He was in Lancaster again in 1905 (13th June) when he ran faster yet in the Two Miles team race – 10:09.6. In 1906 he won the Four Mile race at Royton Sports on 1st August in 20:38.0 to win the Northern Counties AAA title for the distance and later that year joined Salford Harriers where he was a member until his membership lapsed in 1910. A week later, at Fallowfield in Manchester on 7th August, Duncan ran the half-mile in an estimated 1:58.8 off 20 yards. 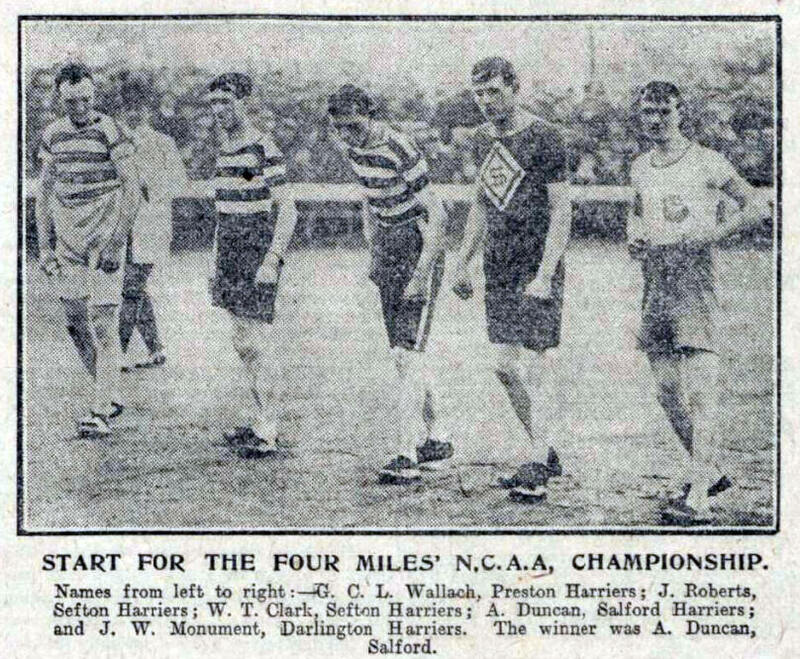 1907 Northern Counties Four Miles – Duncan won but look at the quality of runner there. Duncan did run in the SAAA Championships and despite what they had said about his club affiliation, the ‘Glasgow Herald’ said in its report of 24th June: “All the six entrants turned out. Stevenson led for the first mile. Duncan, the Kendal runner, went to the front in the second mile. In the third mile Duncan spurted and although Stevenson made a bold effort to hold him, the Anglo-Scot by degrees shook off his rival and with a mile to go was fully 30 yards in front. At the bell the winner was leading by almost the length of the straight, and putting in a fast finish, he won by about 150 yards, his time is some six seconds outside McGough’s Scottish record.” The winning time was 20:12.4 with Stevenson timed at 20:28. In its comments section, the paper went on to say – “A Duncan (Salford) justified all that has been said of him here since the Clydesdale Harriers Sports. He will run in the AAA’s championships and expects to get inside 20 mins for the Four Miles. There was no sparkle in Sam Stevenson’s running and Jack was also a little disappointing.” The victory gained him selection for the Scoto-Irish International the following Saturday but he did not travel up for it with Jack accompanying Stevenson in the Four Miles instead. Jack actually won the match race in 20:22. The AAA’s race was held on 6th July and Duncan won the Four Miles – and inside 20 minutes too. He was the second Scot to run inside 20 minutes for the distance, Henry Acland-Munro being the first away back in 1895. Read the report: “A brilliant effort was that of A Duncan (Clydesdale Harriers) in the Four Miles, 19 min 51 2-5th sec having only twice been bettered at the English Championships. We remarked recently that A Duncan would improve on his Scottish championship time and he has done so to the extent of 21 sec.” These championships were held at Fallowfield in Manchester and it was to be the last time for 80 years that they would be held outside of London. He was back in Scotland for the Rangers Sports Meeting on 3rd August. Probably the biggest annual athletics festival in the country with stars from the world of athletics competing and big crowds (in 1907 there were 18,000 spectators) it was where you went if you wanted to be seen. Duncan came for the Four Miles handicap race and finished second. The race was ‘won easily’ by Somerville of Motherwell YMCA from a mark of 350 yards while Duncan was second, running from scratch with the winning time being 20 min 16 1-5th sec. Later in August he was racing in Stockholm where he won the 1500m on 17th August in 4:11.0 and then ran second to John Svanberg over 5 Miles in 25:36.8 and followed it with 5000m in 15:38.4 the next afternoon. 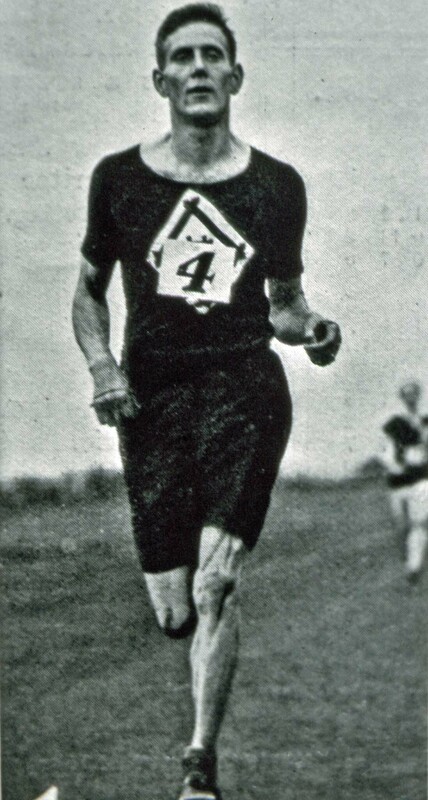 John Svanberg was a double Olympic silver medallist from Athens and in 1907 he ran the fastest times in the world for 5000m (15:13.5) and 10000m (31:30.9). No disgrace in finishing second to such an athlete. What was the competition in Stockholm? Several Swedish athletes were competing in the AAA’s championships and it is possible that some invitations were issued there. In any case, it was an international meeting with two Britons competing: Alec Duncan and E.H. Montague. Duncan ran THREE races in the space of three days. Into September, and is season was still flourishing with 15:05.0 for a Three Miles handicap at Belle Vue. 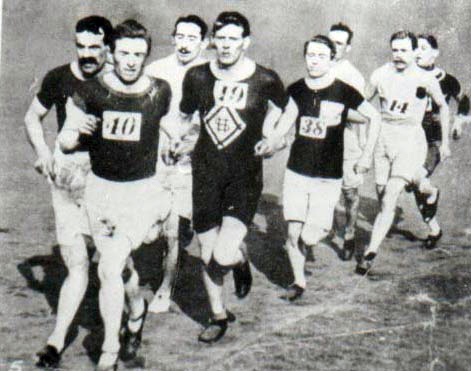 1907 was very good year for Duncan and his target for 1908 was bit higher yet – he wanted to run in the Olympic marathon. He started his season however with the Clydesdale Harriers Sports at Ibrox Park where he ran in the handicap Three Miles but was unplaced in the handicap but recorded a time of 15:19.2 from scratch. He next appears when he runs in and wins the AAA’s 10 miles championship on 18th April at Stamford Bridge after a close fought race in 53 min 40 3-5th sec with the second man on 53 min 41 2-5th sec and Tom Jack of Edinburgh Southern Harriers third in 53 min 42 sec. The first six were within 15 seconds of each other. For the Olympic marathon there were six ‘trials’ to be held and Duncan ran in the 19 Miles Trial at Warburton on 21st March where he finished fifth in 2:01:05. The winner was Fred Lord in 1:50:23 with Wyatt, Perkin and Day being between them. He then ran almost exactly a month later over a longer trial which went from Windsor to Wembley Park and was a distance of 22 miles 1420 yards. This was his his third race in as many weeks. The relative distances were over 19 miles on the road, 10 miles on the track and then this Olympic trial organised by Polytechnic Harriers over 22.5 miles. The first six finishers in the race on 25th April were to be selected for the Olympic marathon. 66 runners took part and the weather has been described as appalling. Rain, sleet and snow all fell during the race and the road surface was described as ‘terribly heavy underfoot. James Beale of Poly Harriers led at 10 miles in 55:19 from Fred Lord (Wisbey Park AC) and Duncan, with Fred Appleby (Herne Hill Harriers) about a dozen yards further back. These three were together at 15 miles in 1:25:55 before Beale moved off and established a lead of about 50 yards. He was caught and passed by Duncan about a mile from the finish and Duncan won the trial by almost 400 yards. Duncan won in 2:15:45, Beale was second in 2:17:00, then came Lord (2:18:04, Tom Jack (Edinburgh Southern Harriers – 2:18:42) Harry Barrett (Poly Harriers – 2:18:46) and Fred Thomson (Ranelagh Harriers – 2:20:05). As the first six finishers in this race were picked for the Olympic marathon, Duncan was selected with Tom Jack and Sam Stevenson also being selected as part of the team to run. With the Olympic event not until the end of July, it was now back to the track for Duncan. In Glasgow on 13th June, at the West of Scotland Harriers Sports, Duncan turned in what was described as a commanding performance in foul weather. “A Duncan made ample amends for his disappointing performance in the Clydesdale Harriers Sports. It was only in the last 50 yards however that he got on level terms with G MacKenzie and it is not often that one witnesses such close finishes in a distance handicap. In good going Duncan might have got inside McGough’s record.” Duncan’s time was 20 min 18 2-5th sec, Graham ran from a mark of 230 yards and the winning distance was two yards. A week later Duncan raced at Crewe to record an estimated time of 14:42 for three miles. 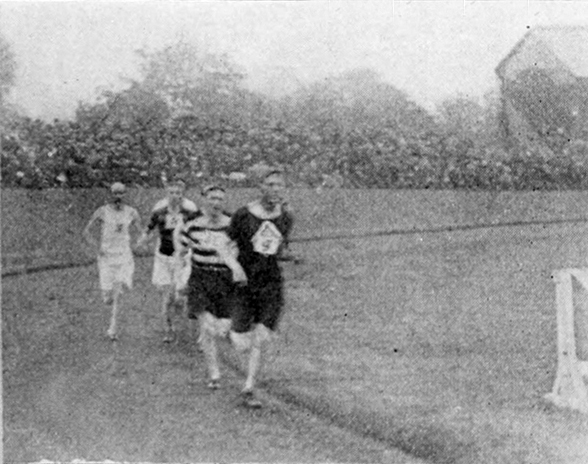 It is interesting to note a comment in the ‘Glasgow Herald’ of 22nd June, 1908, in their preview of the SAAA Championships that “The Four Miles should go to S Stevenson (Clydesdale Harriers) as T Jack is said to be keeping his resources up for Marathon purposes at the Olympic Games.” Three men, three very different methods of preparation for a major event – Duncan racing a lot, Stevenson racing frequently and Jack barely racing at all. On 4th July, Duncan was out in the AAA’s 4 miles championships and could do no better than 6th in a time estimated to be inside 20:40. Presumably he had stepped up the training distances with the Olympics in mind. Then it was time. On 24th July at 2:30 pm the Olympic race started and straight away Tom Jack went into the lead and came through the first mile in 5:01, a really crazy pace but he did not let up coming through 4 miles in 21:18 (the SAAA Four Miles championship had been won that year in 21:52 by – you’ve guessed it – Tom Jack!). At five miles he was clocked at 27:01 and was almost exhausted. After stopping for a drink he never started again. His compatriot Alex Duncan (27:07) also dropped out at that point complaining about sore legs. They were not alone in failing to complete the course: of the 71 named starters, only 27 finished while 44 dropped out. The race was of course not won by Dorando Pietri in 2:54:46, it was Hayes of the USA who emerged victorious in 2:55:18. The trio of Duncan, Stevenson and Jack were to meet up again when they represented Scotland against an Irish- American team at Edinburgh on 19th August over the shorter and more familiar distance of Four Miles. “The Scotch representatives gradually drew away from the only Irish-American competitor, GV Donagh, and a grand race ensued in the home straight. Jack eased up nearing the tape. Won by two yards.” Duncan was the winner in 20 min 52 3-5th sec from Stevenson with Jack third. By 1909, Duncan’s career as an athlete was almost over. A year after the London Olympics, he settled down into married life and joined the Kendal Police Force. In 1910, he took up a post as a police constable at Stoke-upon-Trent and joined North Staffordshire Harriers for a short spell before hanging up his racing shoes for good. It had been a good career in which, apart from the experience of the London Olympic marathon, he took on the best and came out on top more often than not. The London Marathon is noted for all the wrong reasons and one of these is the controversy over the distance which turned out to be further than originally intended or announced but that does not account for the early pace set by Jack and pursued by Duncan among others. Nerves maybe contributed but they had all run enough Four and Ten Mile races to know a bit about pacing. It was the only real blot on an otherwise excellent copy book. What’s missing from this account? What’s missing is anything about cross-country running at a time when the cross-country internationals were big fixtures. Strangely enough there is little trace of Duncan as a cross-country runner although he did finish third when running for Kendal in the North Junior Cross-Country championship in 1906 but even after he joined Salford he cannot be traced as a country runner. Three Miles: 14:42.0e at Crewe on 20th June 1908. 5000m: 15:38.4 at Stockholm on 19th August, 1907. Four Miles: 19:51.4 at Manchester on 6th July, 1907. Twenty Miles: 1:56:26 at London on 25th April, 1908.
the excellent illustrations are from Alex and his colleague Kevin Kelly.